Hagel’s departing shots should be seen as an incentive for self-reflection in the White House. In a recent interview he gave to Stars and Stripes and Military Times, outgoing U.S. Secretary of Defense Chuck Hagel reiterates his skepticism toward the use of U.S. military power in imposing American values abroad. “You cannot impose your will, you can’t impose your values, you can’t impose your standards, your institutions on other societies and other countries. It has never worked; it never will work, as noble as you believe [the effort] is,” he is quoted as saying. Hagel also repeatedly voiced his concern that the United States will continue to be engaged in drawn out conflicts with no end in sight. Even before becoming secretary of defense, Hagel’s basic mantra was to question all fundamental assumptions of U.S. defense and foreign policy. For example, as quoted by Bob Woodward, Hagel cautioned U.S. President Barack Obama: “’We are at a time where there is a new world order. We don’t control it. You must question everything, every assumption, everything they’ — the military and diplomats — ‘tell you. Any assumption 10 years old is out of date. You need to question our role. You need to question the military. You need to question what are we using the military for.’” I echoed this in a recent post of mine calling for “disenthrallment” in order to produce good defense and foreign policy analysis. The biggest lesson of the wars in Afghanistan and Iraq is that the only real choice you have is when you enter a conflict. The filmmaker Rory Kennedy, who recently directed a new documentary on the Vietnam War entitled Last Days Vietnam, says that this was her biggest takeaway from shooting the film. Once you are engaged in a war, you ultimately will have to choose between lesser evils, because most decisions will be out of your hands. As Abraham Lincoln put it during the U.S. Civil War, “I claim not to have controlled events, but confess plainly that events have controlled me.” As Clausewitz attempts to show, war has a nature of its own filled with “primordial violence, hatred and enmity” and “the play of chance and probability,” which makes it a terrible, unpredictable instrument for advancing a country’s national interest. 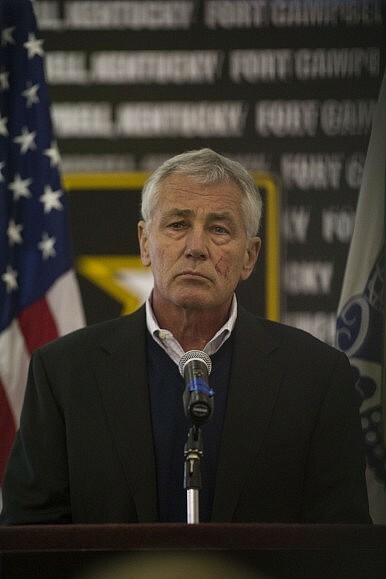 Thus, Chuck Hagel’s remarks may be a useful incentive for self-reflection in Washington D.C.